The velocity of money is the number of times a dollar changes hands in a certain period of time. 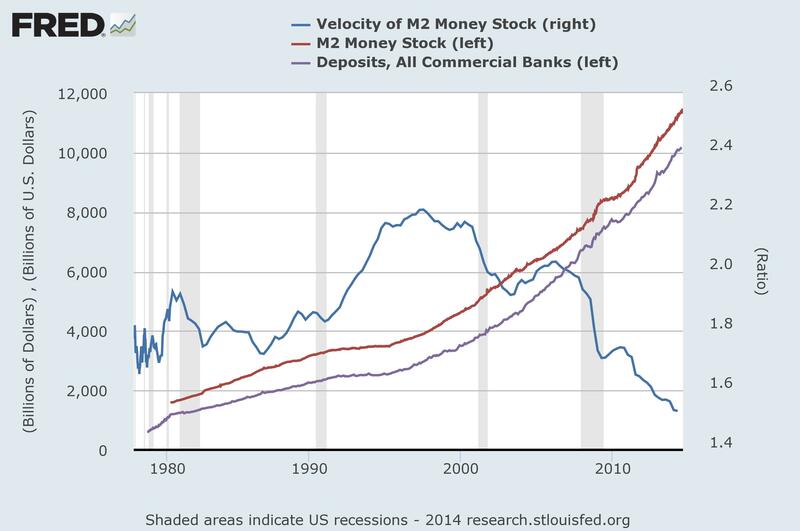 The blue line falling on the right side means money is hardly moving. Production, earnings, and spending are depressed. Folks, there is no recovery. Capitalism has failed. When it fails, the 1% panic and start militarizing the police, rigging elections, starting wars, and creating a surveillance state. The red line shows that creation of money is at an all time high, and the rate of money creation is accelerating even now. The purple line shows that all this money is going to bank deposits of the 1%. So the bankers policy of printing money and increasing their own wealth at our expense has not resulted in a recovery. This is no recovery. This is another financial bubble, protected by systemic corruption, a lying corporate media, and an obstructionist Republican Congress owned by the 1%. This is not stimulus. This is a fraud whose victims are the great majority – we who must work for a living, pay taxes, or deal with homelessness, hunger, depression, and violence. The U.S. government plays a central role in perpetuating the Israeli occupation of Palestine. American debate on the hundreds of civilian deaths in Gaza and the intractable Israeli-Palestinian conflict is polarized between feelings of sympathy with civilian victims on either side and mutual vilification of the Likud-led government of Israel and the Hamas-led government in Gaza. But it may be more constructive for Americans to think about the role that the U.S. government plays in perpetuating this never-ending and heart-rending conflict. Opinion polling during a crisis tends to reflect the passions of the moment, but Americans have told pollsters for decades that we want our government to take an even-handed position on the Israeli-Palestinian conflict. 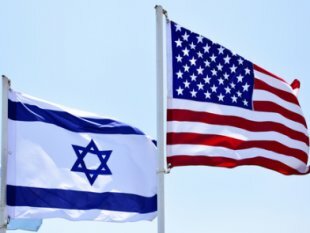 A Chicago Council Global Views survey in 2012 found that 65% of Americans want the U.S. to “not take either side”, while only 30% want it to “take Israel’s side”. That majority rose to 74% vs 17% at the height of the U.S. war in Iraq in 2004. The problem isn’t geography, demographics, or money—it’s federal will. Aug 13, 2014 – Virtually every wealthy nation in the world has invested in a high-speed rail network—with the striking exception of the United States. From Japan to France, even from Turkey to Russia, trains travel through the country at speeds of 150 miles per hour or above, linking city centers and providing a desirable alternative to both air and automobile travel. Meanwhile, outside Amtrak’s 28 miles of 150-m.p.h. track in rural Massachusetts and Rhode Island, the American rail network is largely limited to speeds of 110 m.p.h. or less. There are few reasons to think the situation will change much in the coming decades. So why has the United States failed to fund and construct high-speed rail? The problem is not political process. Most of the countries that have built high-speed rail are democratic, and have submitted the projects to citizen review; others, like Germany and Russia, have federated governments similar to ours that divide general decision-making between levels of authority. Nor is it geography. The British and French completed a 31-mile tunnel under the British Channel 20 years ago, while many American cities are located in flat regions with few physical construction obstacles. Nor is it the characteristics of our urban areas. While U.S. cities are less dense than those of many other countries, the Northeast is denser, more transit reliant, and more populated than most areas served by high-speed rail abroad. Nor still is it money. Though the United States invests less in infrastructure than other developed countries do, America nevertheless remains an immensely wealthy nation perfectly capable of spending on new rail links if desired. What’s missing is a federal commitment to a well-funded national rail plan. Instead, we have a political system in which the federal government, having devolved virtually all decision-making power to states, cannot prioritize one project over another in the national interest. We have a funding system that encourages study after study of unfundable or unbuildable projects in places that refuse to commit their own resources. And we have a bureaucracy that, having never operated or constructed modern intercity rail, doesn’t understand what it takes. This helter-skelter approach to transportation improvements is fundamentally incapable of supporting large-expenditure, long-range projects like high-speed rail. This wasn’t always the case. In 1956, Congress approved a significant increase in the federal gas tax, and with it a national plan for interstate highways. That plan, which included a steady stream of funding and a clear map of national priorities, was mostly completed over the next three decades. Though implemented by states, highway alignments were chosen at the national level, with the intention of connecting the largest cities, regardless of political boundaries. Funding came almost entirely (90 percent) from the national government and was guaranteed as long as a route was on the national map. Physical requirements for roadways were mandated at the national level and universally applied. And construction was completed by state departments of transportation that were technically knowledgeable, accustomed to building such public works, and able to make decisions about how to move forward. The result was a system of roadways that most Americans rely on, often daily. The interstate system is unquestionably the nation’s transportation lifeblood. Yet Americans do not have the same perspective on the role of the federal government that they had when this highway system was initially funded. Trust in Washington has declined from more than 70 percent during the 1950s to less than 20 percent today. So while President Dwight Eisenhower declared in 1955 that the federal government should “assume principal responsibility” for the highway system, its approach to a high-speed rail network has reflected this change in public thinking about Washington’s place in transportation planning. The response has been to reduce the federal government’s ability to commit to a long-term plan and associated funding. Recent efforts to revive this federal role have been seriously flawed. Take the Obama administration’s attempt at a national plan of proposed intercity rail investments in 2009. For starters, the map’s proposed routes were vague, a number of important connections were not identified, and some routes appeared to have been chosen at random—simply the consequence of previous state studies with no national outlook. Funding had been dedicated through an initial $8 billion included in the stimulus bill, but there was certainly no guarantee that railways on that map would be built in the long term. The definition of “high-speed rail” was not applied universally; the administration proposed some links at 90 m.p.h. and others at more than 250 m.p.h., with no explanation for why some would be fast and others not. Finally, many of the states that were supposed to be implementing these projects were woefully unprepared for the task, having made few such investments in the past. None had the experience of building 200 m.p.h. electric railways to the international standard. Such an approach to national transportation doesn’t work. It leaves too many planning questions open to state decision making, and it fails to offer a financing source that actually produces the funds needed for intercity rail. Far from fulfilling Eisenhower’s mandate of assuming principal responsibility, the latest high-speed rail plan assumed too little. It would be ridiculous to plan an intercity transportation system at the state level. But the need is still there. With falling automobile vehicle miles traveled, rising transit use, and booming city centers, we need new ways to connect our cities. More highways are not the answer, not only because they pollute the environment and destroy the neighborhoods they pass through, but also because they’re relatively slow and become congested almost as soon as they’re built. With a growing population, the country needs an expanded transportation system. The United States must invest in clean, neighborhood-building, and congestion-relieving trains, but we cannot expect states to pick up the slack of an uncertain federal government. The planning and funding of the interstate highway system was premised on the fact that the travel needs of Americans occur irrespective of state lines. Indeed, the 50 largest metropolitan areas, representing more than half of the country’s population, are located in 31 separate states and 15 of them actually straddle state borders. Given this reality, it would be ridiculous to plan an intercity transportation system at the state level. California’s high-speed rail progress—its proposed San Francisco-to-Los Angeles line remains the only truly fast train project in the country—is the exception that proves the rule; that state’s size makes it no example for the rest of the nation. It’s time for the United States to commit to national planning, funding, coordination, and prioritization of rail investment. Intercity transportation systems require active federal engagement to guarantee the development of routes that reflect national needs and national priorities. Yet without political consensus on the need to develop national goals and focus investments, high-speed rail will remain a pipe-dream for decades to come. This article is part of ‘The Future of Transportation,’ a CityLab series made possible with support from The Rockefeller Foundation. Where Is Plan B? How About Manufacturing for Clean and Green Renewables if the ‘Cracker’ Fails? Or Even if It Doesn’t? Aug. 14, 2014 – Royal Dutch Shell is shuffling its portfolio of natural gas holdings to increase attention on the Marcellus and Utica shale formations in northern Pennsylvania. The energy giant announced on Thursday that it is selling drilling rights to mature gas producing areas in Wyoming and Louisiana in separate deals in exchange for $2.1 billion in cash and 155,000 acres in Potter and Tioga counties, where it operates gas wells. The announcement followed a deal on Tuesday in which Shell said it was selling 208,000 acres in Western Pennsylvania and eastern Ohio to Rex Energy for $120 million. Shell spokeswoman Destin Singleton said the seemingly contradictory moves in Pennsylvania are part of the company’s regular review of its mix of energy production assets to improve value for its shareholders. Shell is working to focus its onshore drilling program on a few of the more prolific formations in an effort to boost profitability. The company wrote down the value of its shale acreage in the United States by $2.1 billion last year amid lower natural gas prices. In one of the two deals announced on Thursday, Shell said it will sell its Pinedale acreage in Wyoming to Houston-based Ultra Petroleum for $925 million plus the land in Potter and Tioga counties. Shell and Ultra have been partners in a joint venture in northern Pennsylvania. Shell will acquire 100 percent of the joint venture. In the second deal, Shell will sell its gas assets in northern Louisiana, known as Haynesville, to Dallas-based Vine Oil & Gas LP for $1.2 billion. Shell and other major oil and gas explorers regularly sell rights to fields where production is flat or declining. They then use that cash to fund exploration programs designed to discover new or more prolific fields that oil giants need to fuel growth. The Pinedale and Haynesville formations produce dry gas, which is less profitable than oil or so-called natural gas liquids, at relatively moderate rates. “It’s a good sign that they’re still committed to the Marcellus,” Brinker said. August 4, 2014 – Since President Obama’s inauguration and Rick Santelli’s movement-making call to action that inspired the tea party, national politics has been a triangular affair, with the Republican “establishment” caught in the middle between an anti-incumbent reaction and a seemingly united Democratic front. This triangular dynamic guiding policymaking in the past few years — from the credit downgrade to the fiscal cliff to the government shutdown – has led to the exclusion of the progressive wing of the Democratic Party from having much of a say in legislative affairs. Like the Republican Party, the Democratic Party is not without its own internal fissure – one that could widen and surface preceding the presidential primary process when the Democratic Party will have to reinvent itself in the waning months of the Obama era. An ideological and organizational X-ray of the Democratic Party in Congress reveals a surprising split: there are approximately 20 members of the moderate Blue Dog Coalition in the legislature, while the Congressional Progressive Caucus (CPC) boasts more than 60 members. With progressive and even nonpartisan outlets and pundits calling for progressive candidates like Sen. Elizabeth Warren (D-Mass.) and Governor Martin O’Malley (D-Md.) to run, progressives – much ignored in the fracas of the last several years — might begin to find venues to ventilate their ideas. 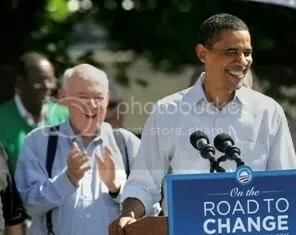 "The Better Off Budget promised to create 8.8 million jobs by 2017 — including 4.6 million after one year." The CPC — founded in 1991 and currently led by Rep. Keith Ellison (D-Minn.) and Raúl Grijalva (D-Ariz.) — has been especially active since the 111th Congress took its collective seat in 2009 and has not been afraid to challenge the president during his politically-mandated drift rightward since taking office.